Travelling Shillong Lajong FC will face a tough challenge from home side Minerva Punjab. . .
Minerva Punjab FC will be gunning to improve their not so impressive record against Shillong Lajong FC in the Hero I-League when the two clubs go head to head at the GN Stadium, Ludhiana, on Tuesday at 4:30 PM. The hosts are in 8th position with 11 points; while on the other hand, Shillong Lajong is in 5th position, with 16 points in their kitty. With no injury concerns to cater to against Lajong, Minerva Punjab is expected to field their strongest side on Tuesday. Fresh from a narrow margin defeat against the Blues, the Punjab team is expected to put up a fight against SLFC. Lajong, who are the obvious favorites for the match, look quite formidable in comparison to their opponent this time. Lajong FC has no injury concern so far and has a full squad to choose from. 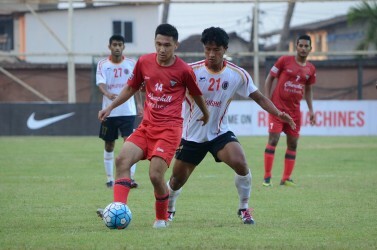 Thangboi Singto’s side has emerged as a well organized side after their devastating opening during the first 4-5 matches and could be another stumbling block for Minerva in the next game, although they have lost their last couple of matches. Both these teams will be facing each other for the 2nd time in I-league and odds are in favour of Shillong. Shillong had the last laugh with home match ended with a 2-1 margin last January, which means Minerva is yet to open their victory account against Shillong. Minerva had a busy transfer window earlier this year in which they had made a gem of a bargain when they snooped up youngster Anirudh Thapa on loan from Chennaiyin FC. A Nepali descent footballer, Thapa has since taking the opponents on behalf of his team. One of the most promising young midfielders of his generation, Thapa acts as a box-to-box midfielder, going on both forward runs as well as tracking back to defend against opponent counter attacks. A versatile midfielder, Thapa can play anywhere in the middle of the park but likes to operate from the wings. If played accordingly, Thapa is expected to be the shinning sparkle amongst the Minerva Punjab squad. The former DSK Shivajians forward is currently enjoying a purple patch of his career. The Cameroonian forward has scored nine goals in the league this season and is also the top scorer of the I-League. Dipanda is a well-known figure in the country for his goal scoring ability, pace, runs both on and off the ball. A visionary footballer, Dipanda is also a master of pinpoint passes which has been effective for Shillong Lajong in the link-up play this season. If displayed a similar performance as the past few games, Dipanda is sure to steal all the limelight for himself against Minerva on Tuesday. Das, Kamalpreet, Nurain, Amobi, Loveday, Ngaihte, S.Das, Bodo, Sayed, Thapa, Singh. The match will be telecast live on Ten 2 from 04:30 PM on Tuesday. You can also follow live commentary of the game on Khelnow.com.